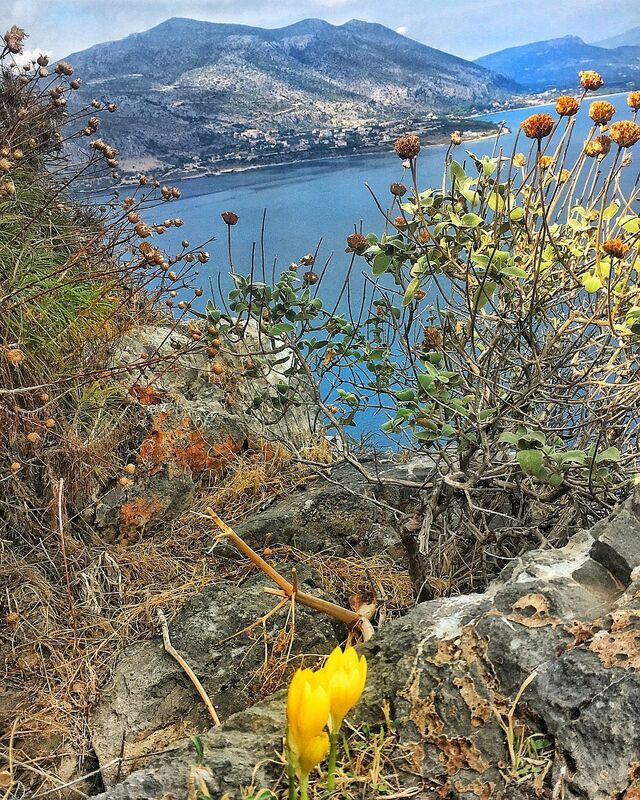 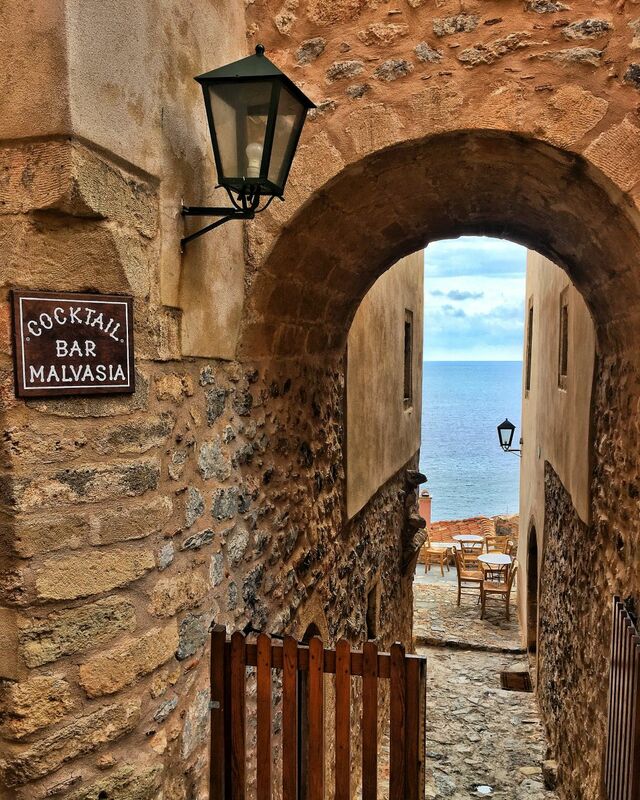 Monemvasia, orasul-castel sau orasul cetate, este locul unde secole diferite coexista intr-un mod magic si fascinant si cred ca are unul dintre cel mai puternice good vibes pe care le-am intalnit pana acum intr-un spatiu. 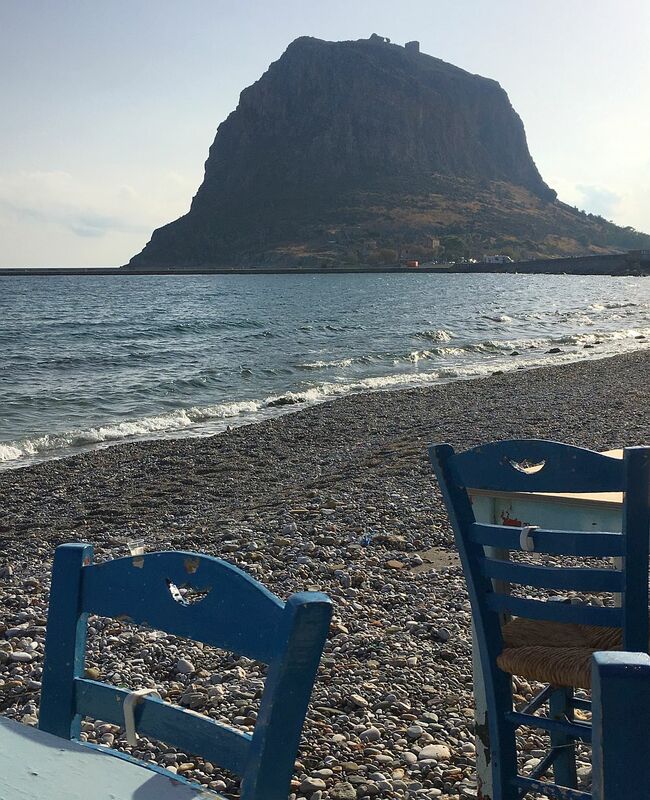 Aflata la 300 km de Atena si 200 km de Kalamata, in partea estica a peninsulei Peloponez, cetatea Monemvasia se afla in varful unei stanci, pe o mica insula desprinsa de continent in urma unui cutremur stravechi, si legata acum printr-un drum de 250 metri. 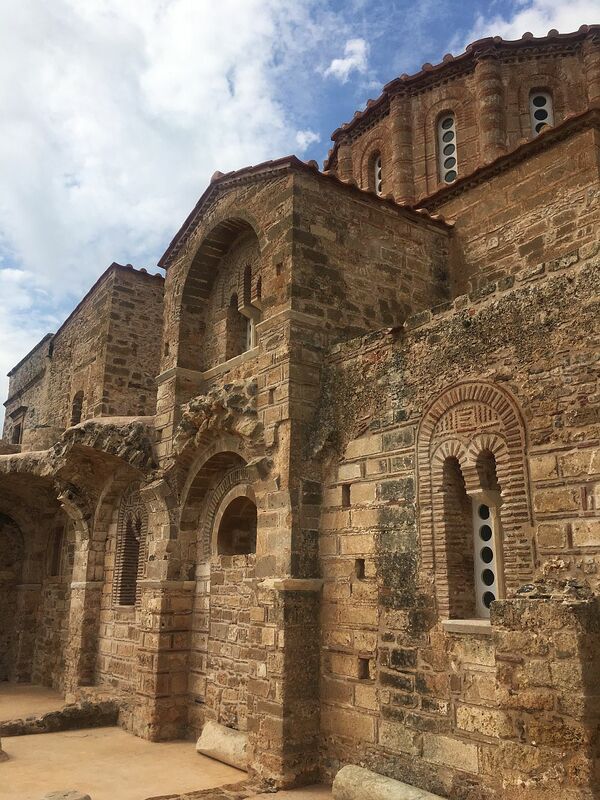 Fortareata medievala, fondata in anul 583, pastreaza inca intacte multe dintre zidurile din perioada bizantina, precum si cateva biserici si manastiri. 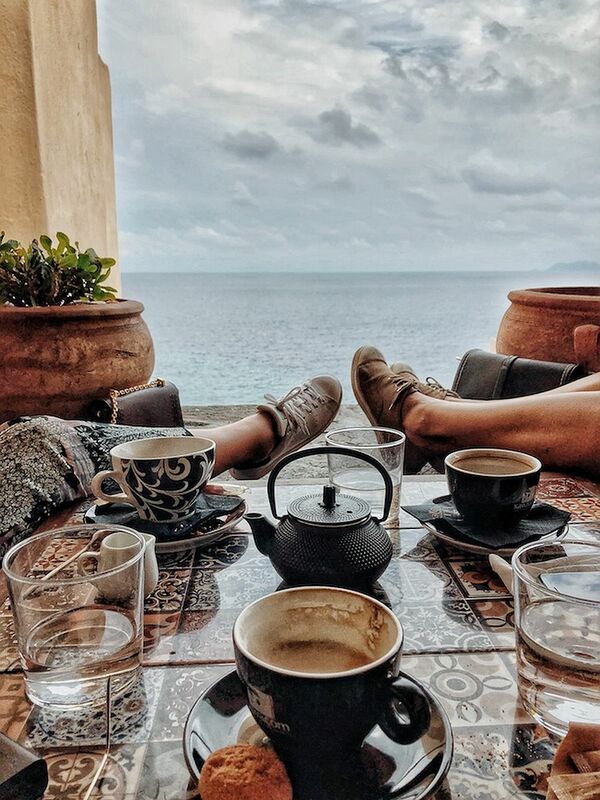 Port strategic si maritim ocupat apoi pe rand, de turci si venetieni, fortareata a fost locuita permanent, de aceea are aerul firesc al unui orasel plin de viata. 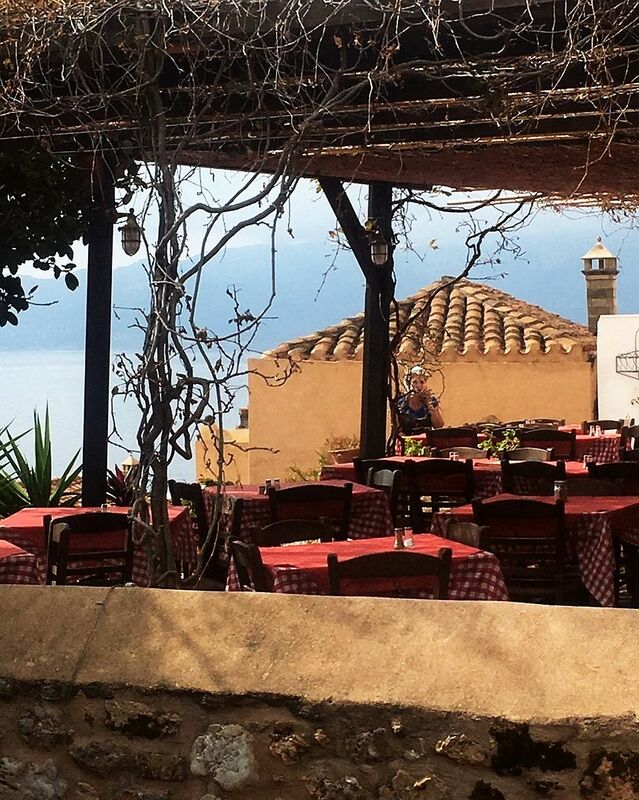 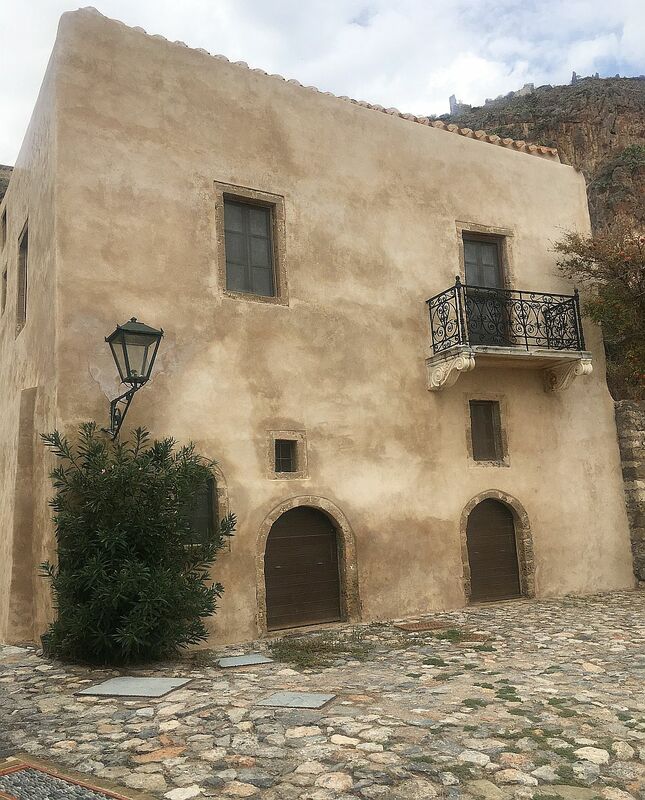 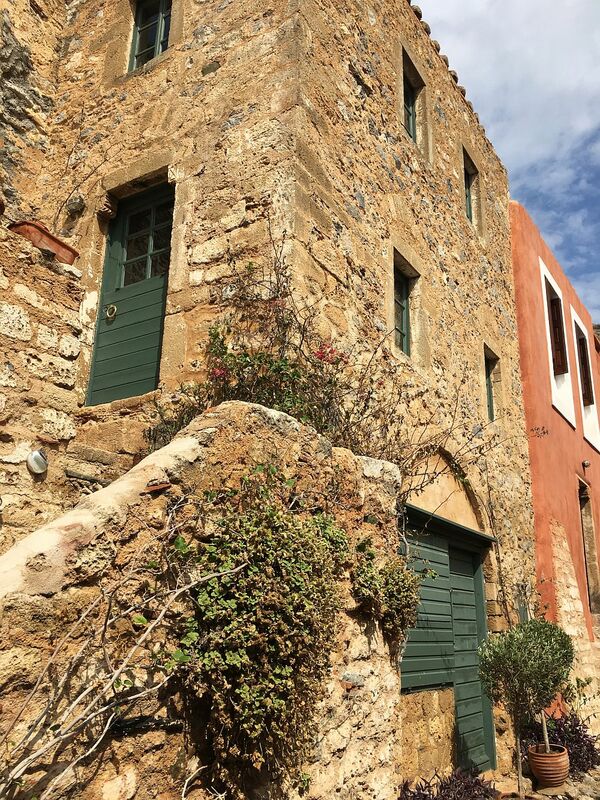 Aflata in patrimonial cultural, Monemvasia a beneficiat de un plan de urbanism intelept, care a protejat-o de a deveni prea turistica si de constructiile moderne, asfel incat orice cladire sau lucrare de restaurare din cetate trebuie aprobata in prealabil si in detaliu. 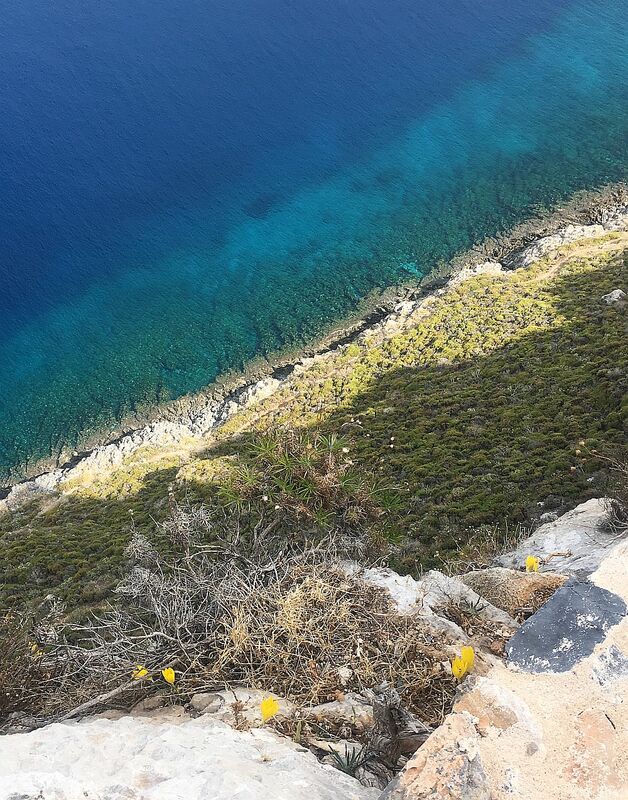 Pe strazile pietruite si rezervate exclusiv pietonilor poti intalni adesea cai ce trag de mici carute care asigura aprovizionarea cetatii, iar aerul de mister este completat de panorama splendida catre apele de turcoaz ale Marii ionice, ce o inconjoara din toate partile. 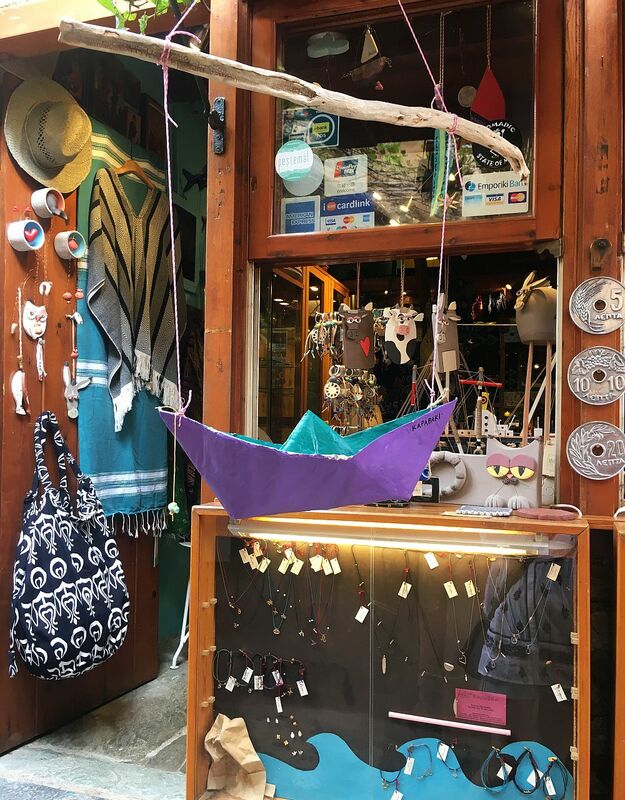 De-o parte si de alta a strazii principale sunt multe magazine-boutique cu suverniruri, haine, cosmetice, masline si ulei de masline din zona, toate cu produse locale, iar in piateta centrala se afla biserica Christos Elkomenos, din secolul VI si vizavi, o moschee ce gazduieste colectia arheologica din Monemvasia. 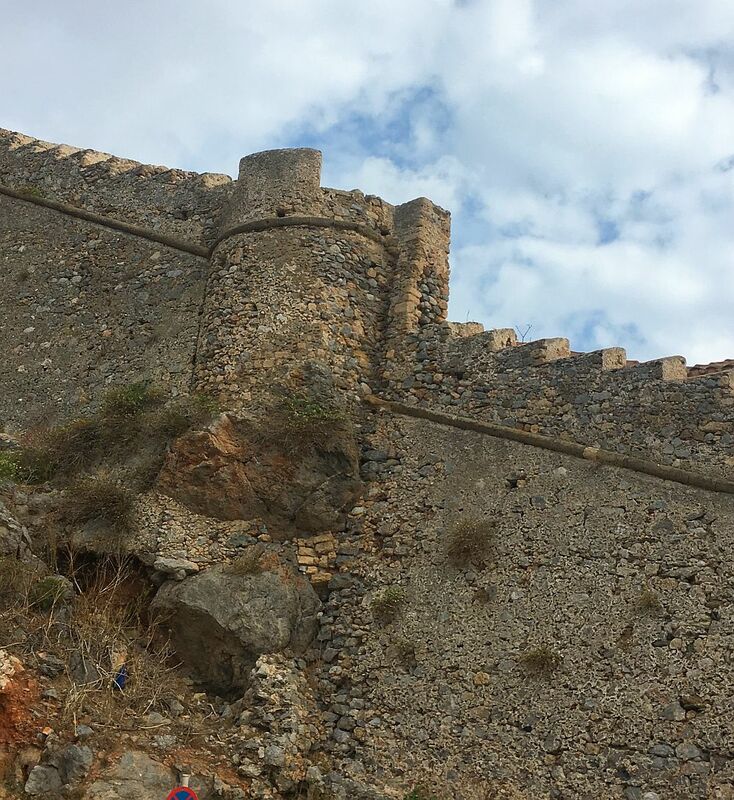 Tot aici sus, la 300 metri desupra nivelului marii, se afla o biserica impunatoare din secolul XII, Aghia Sofia, ce domina intreaga asezare. 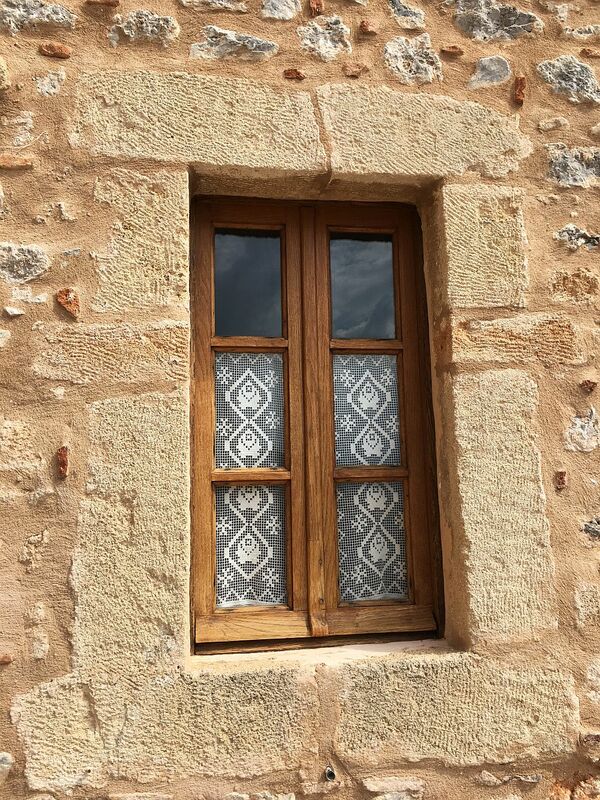 Cetatea este plina de boutique hoteluri, cu decoruri interioare moderne sau eclectice, ce mixeaza elemente traditionale de arhitectura si design cu cele actuale. 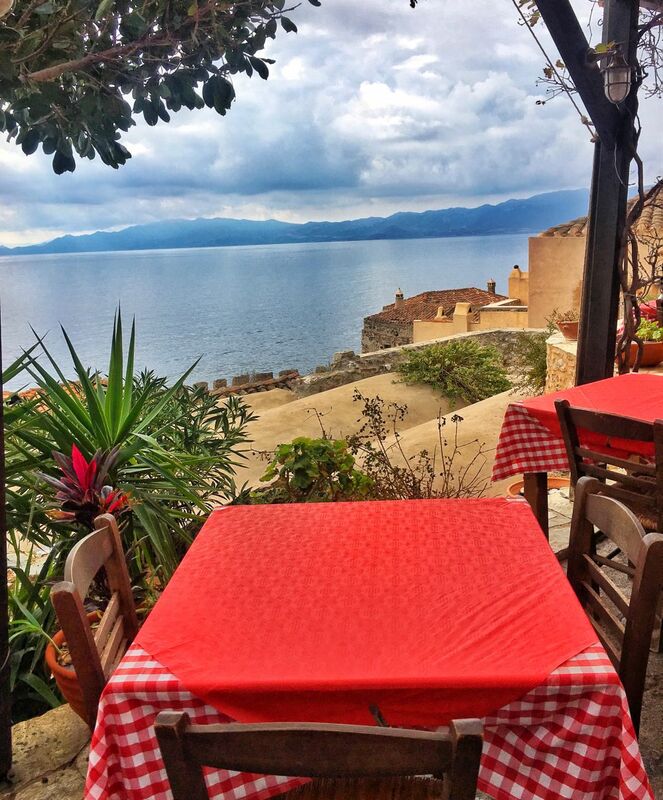 Restaurantele, cafenele si tavernele sunt foarte ispititoare, mai ales pentru o cina la lumina lunii, in sunet de valuri, cu mancarea greceasca savuroasa si vinul local de Malvasia. 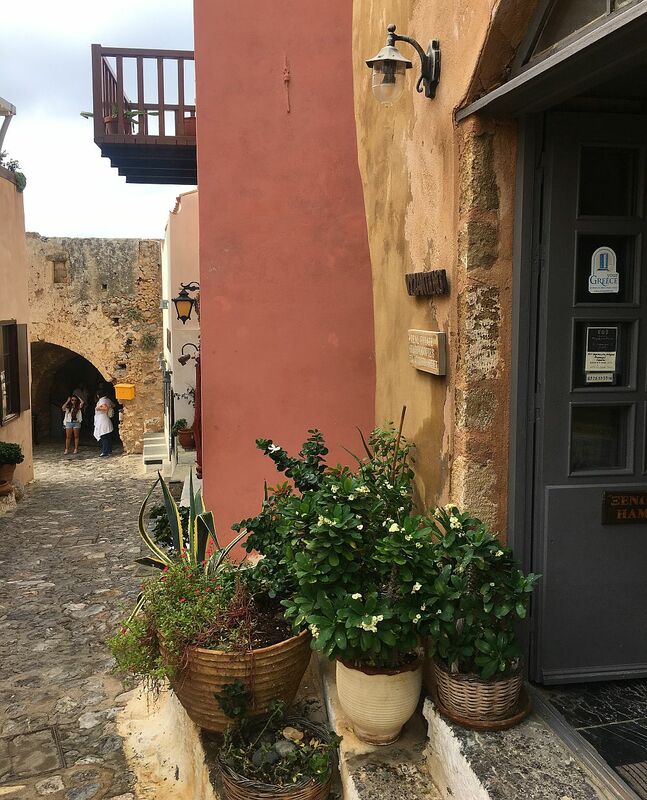 Dintre preparatele traditionale din cetate as mentiona goges – paste facute-n casa sau saltia – un fel de placinte cu branza prajite cu ierburi aromatice. 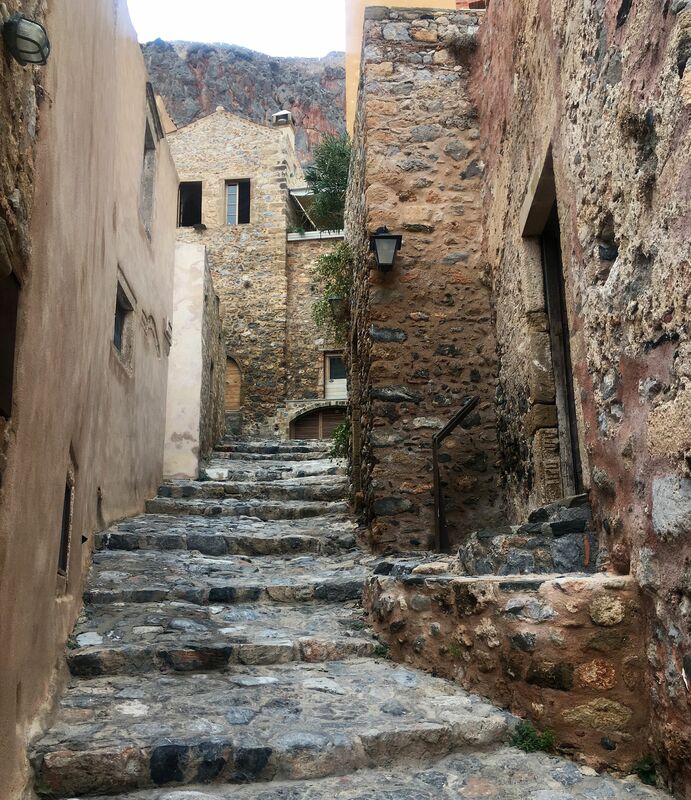 Monemvasia este un loc unde epoci diferite coexista simultan, ca intr-o masina a timpului fantastica, cu stradute si cotloane care te-ndeamna sa le strabati, sa le descoperi si sa simti istoria intr-un mod relaxat, boem si plin de mister. 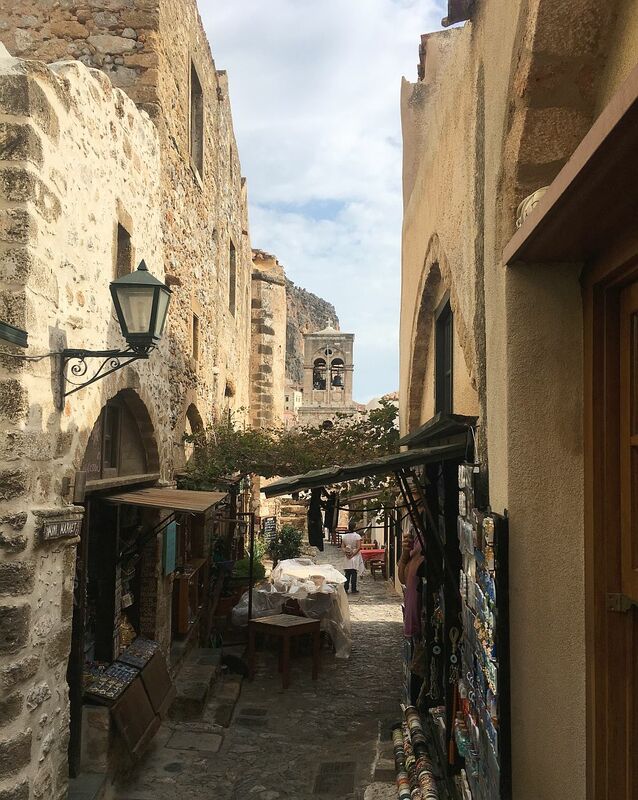 Monemvasia, the castle-town or the fortress-city, is the place where different centuries coexist in a magical and fascinating way and I think it has one of the strongest good vibes I’ve ever encountered in a space. 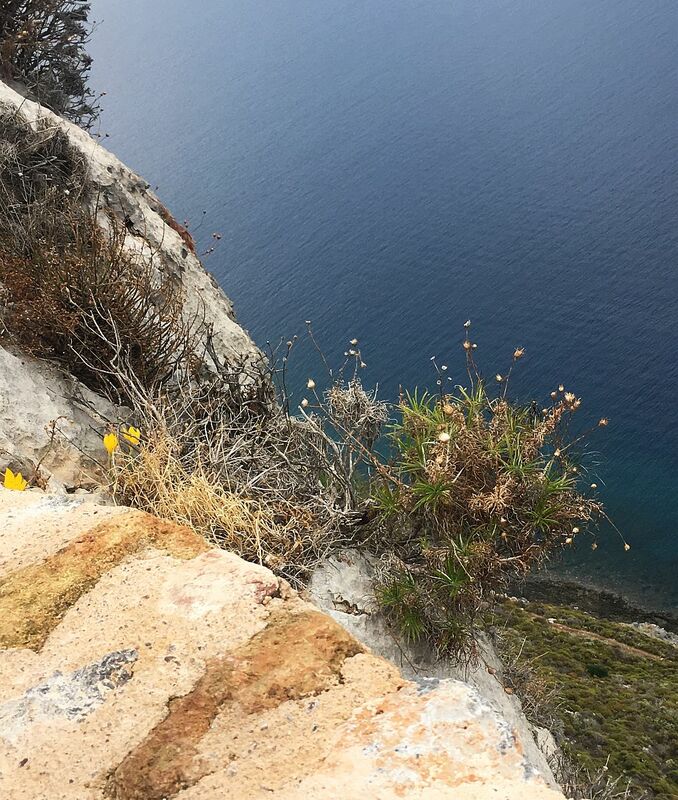 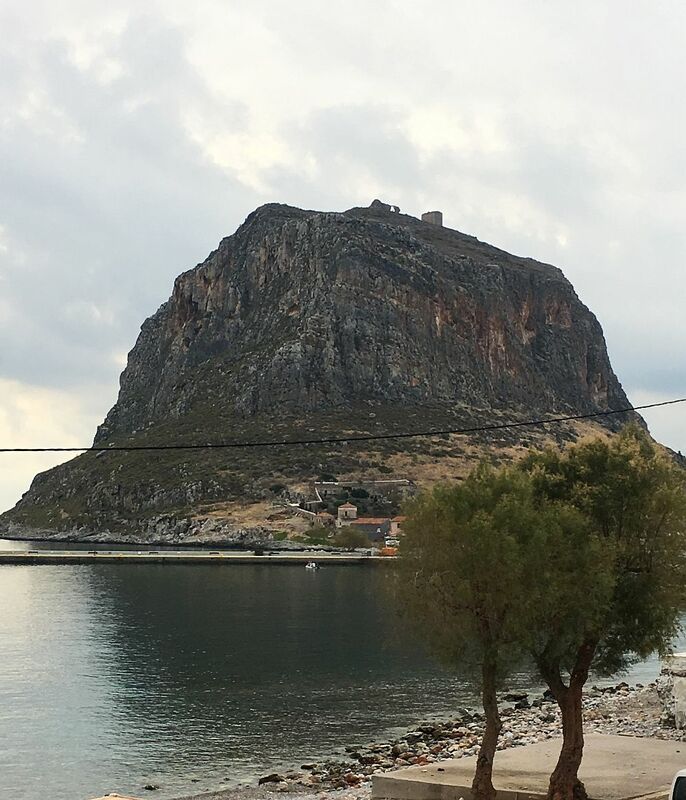 Located 300 km from Athens and 200 km from Kalamata, in the eastern part of the Peloponnese peninsula, the Monemvasia fortress is at the top of a cliff, on a small island, which was stripped of the continent by an ancient earthquake, and now linked by a 250 meters casual way. 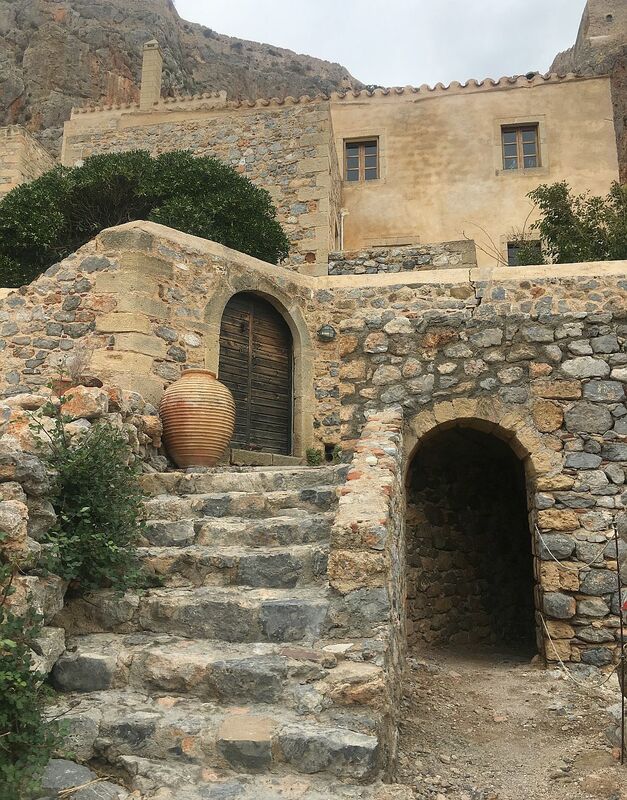 The medieval fortress, founded in 583, still retains many of the walls of the Byzantine period, as well as several churches and monasteries. 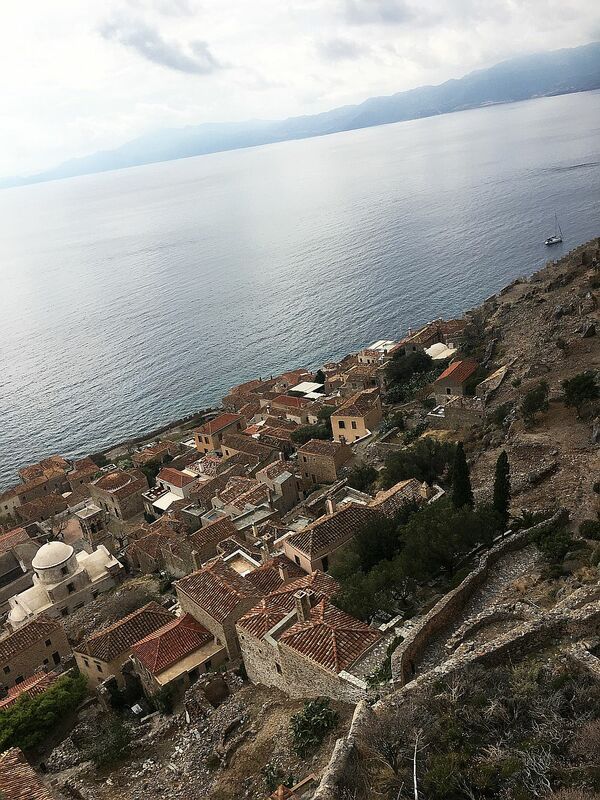 Strategic and maritime harbor occupied by the Ottomans and Venetians, the fortress was inhabited permanently, that is why it has the natural air of a lively town. 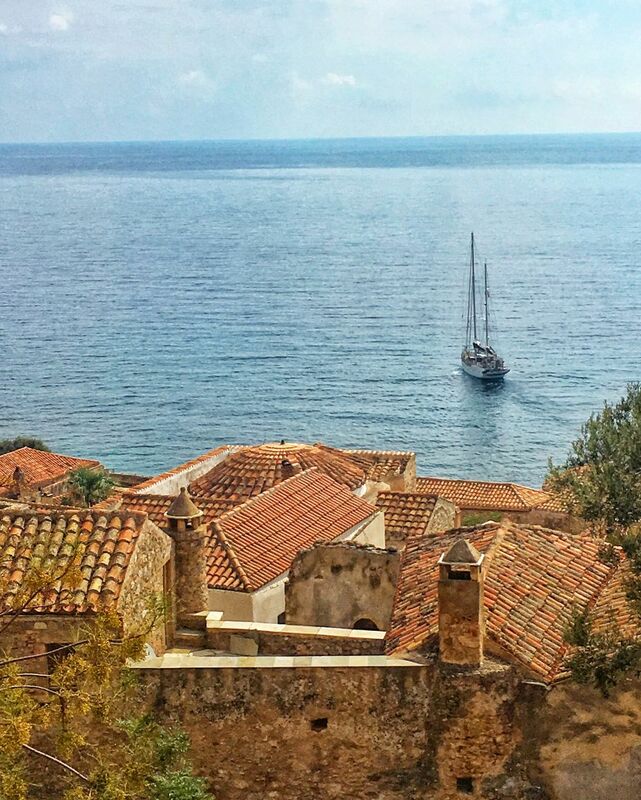 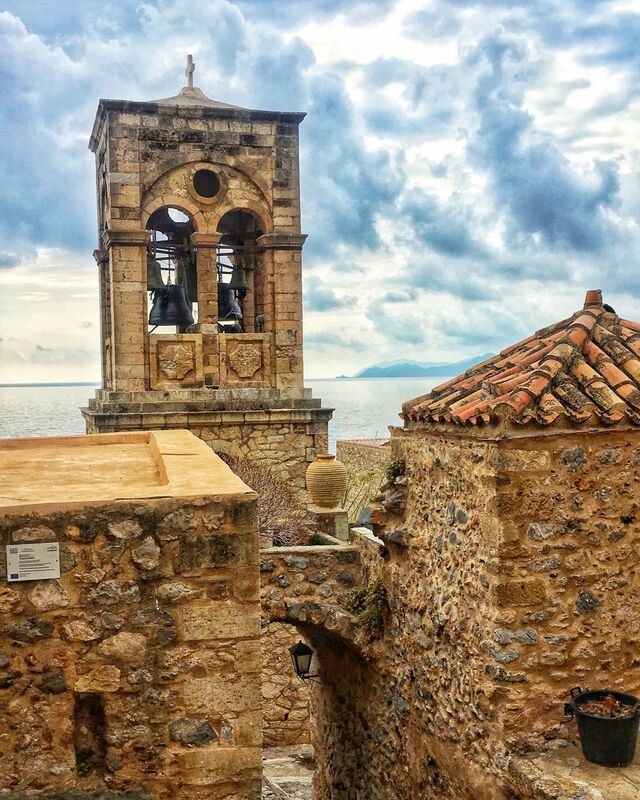 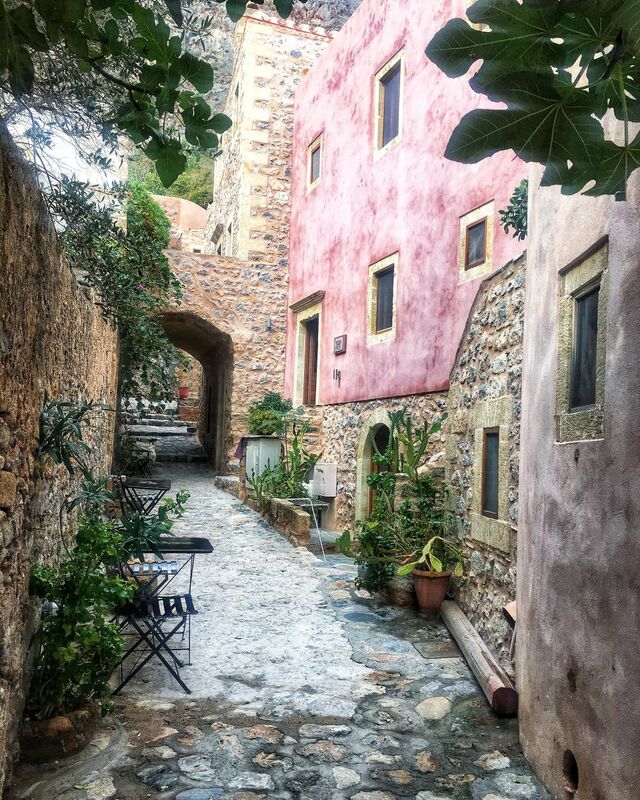 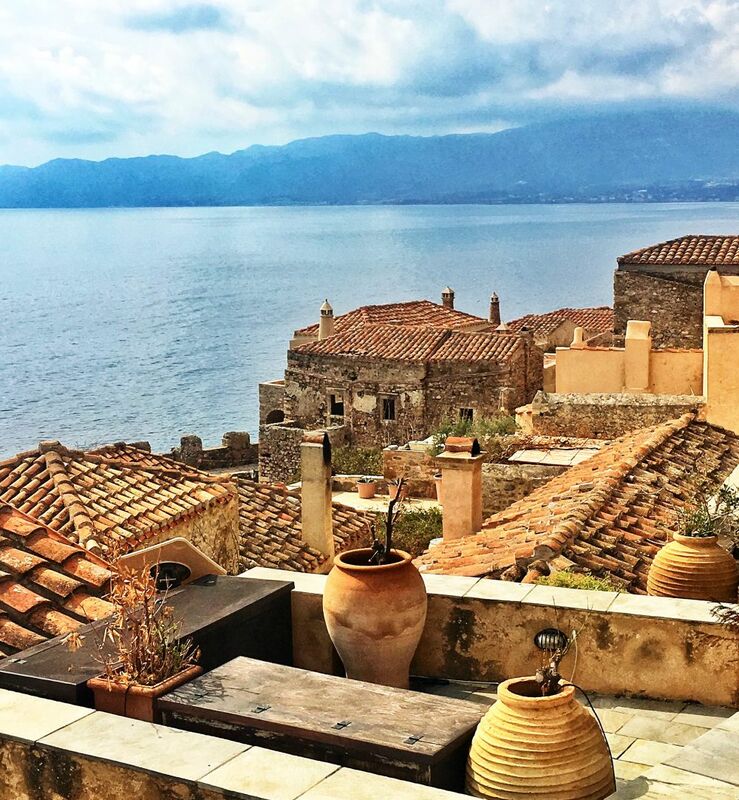 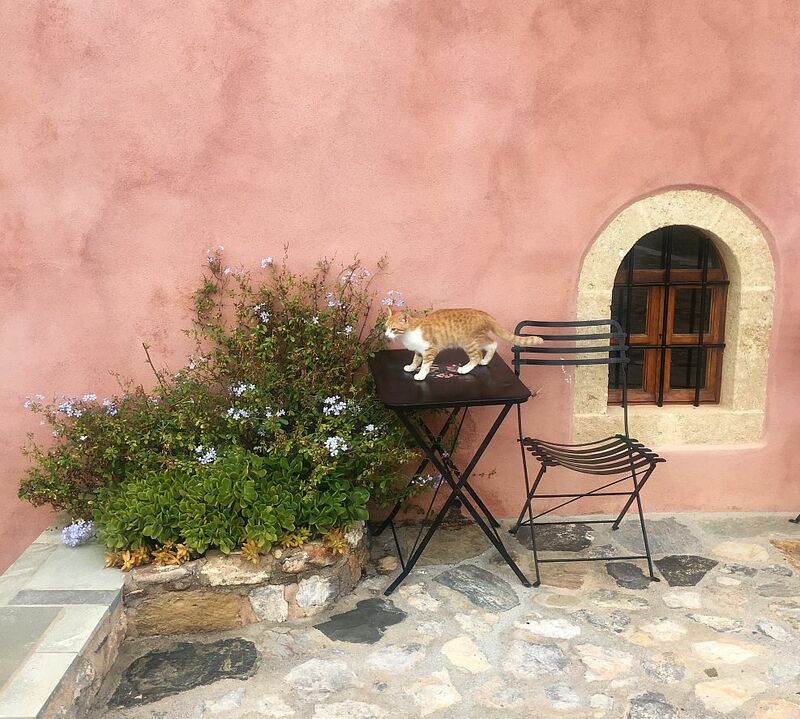 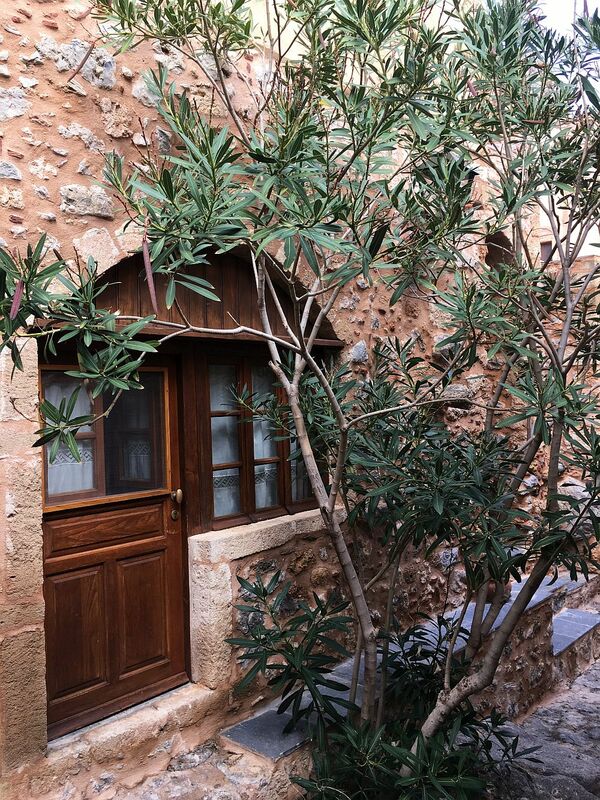 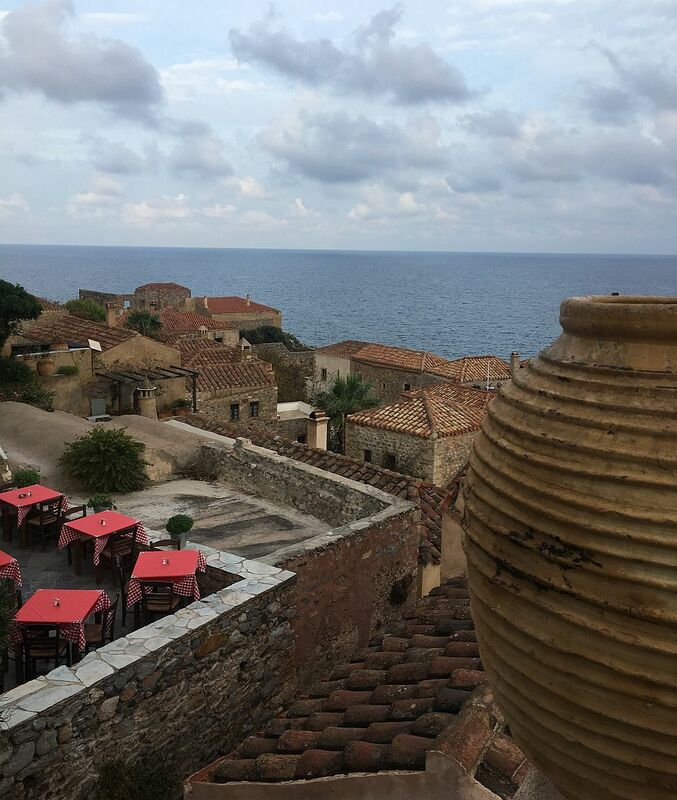 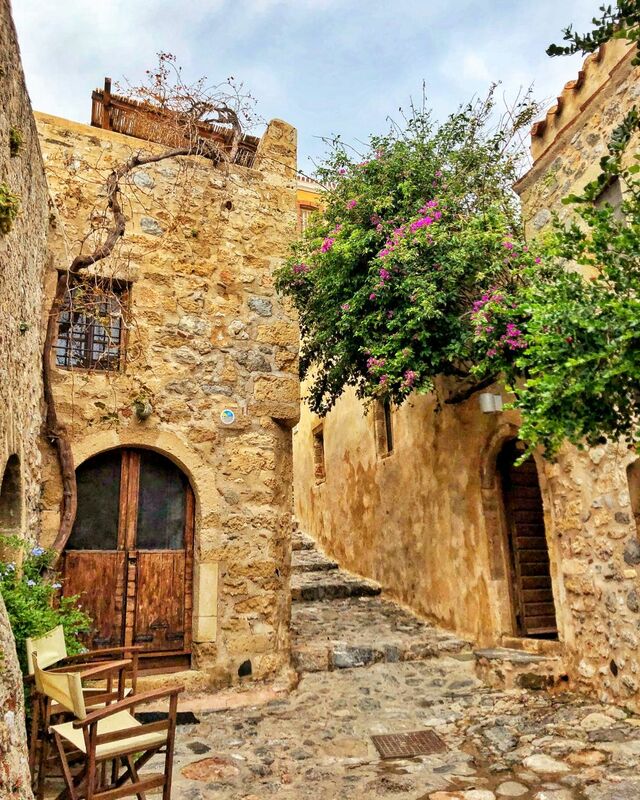 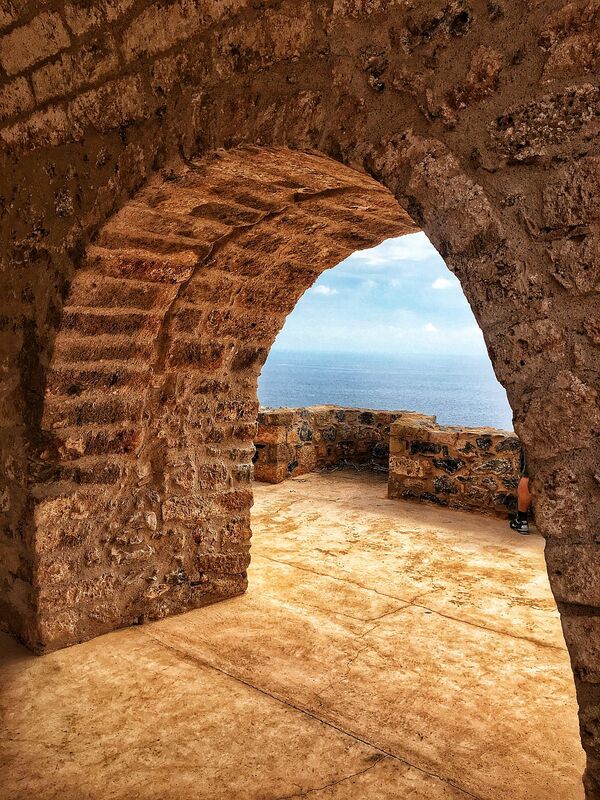 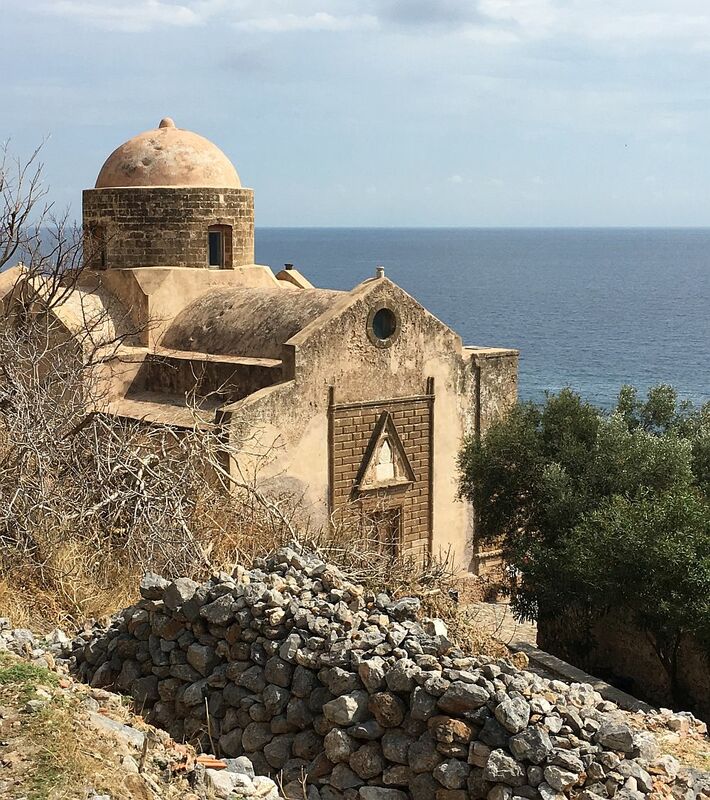 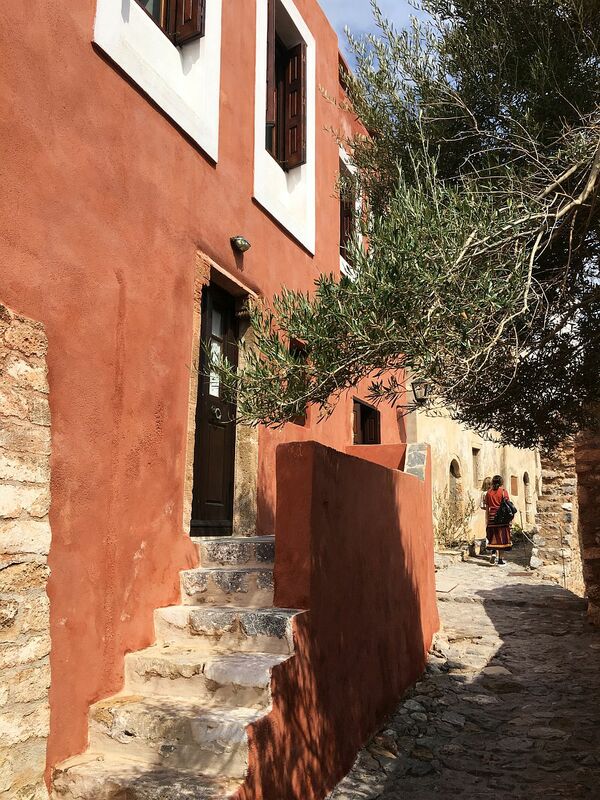 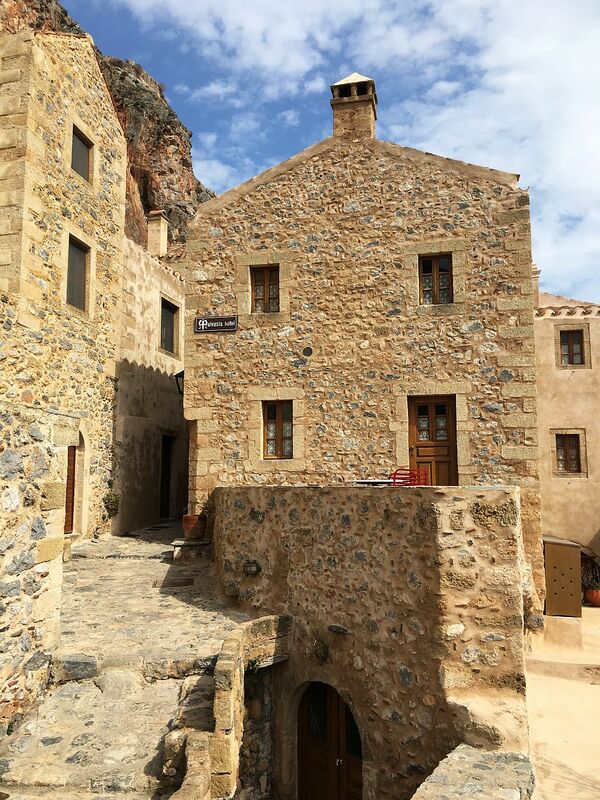 Located in cultural heritage, Monemvasia benefits from a wise urban plan, which has protected it from becoming too touristy and filled with modern buildings, so that any construction or restoration work has to be approved in advance and in detail. 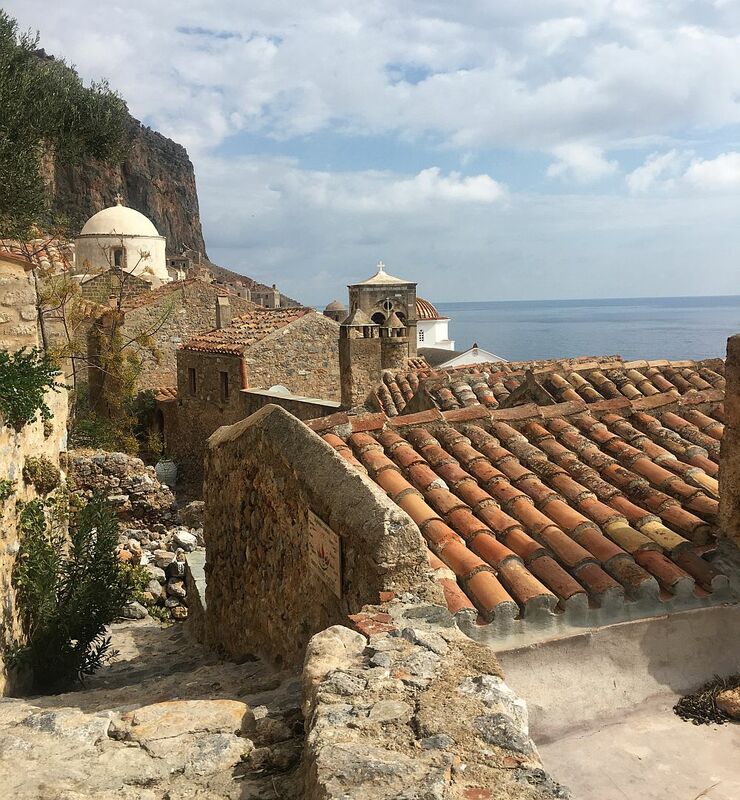 On the cobbled streets and reserved exclusively for pedestrians, you can often encounter horse-drawn carts that provide the city’s supply, and the mysterious air is filled with splendid panorama to the turquoise waters of the Ionian Sea, which surrounds it from all sides. 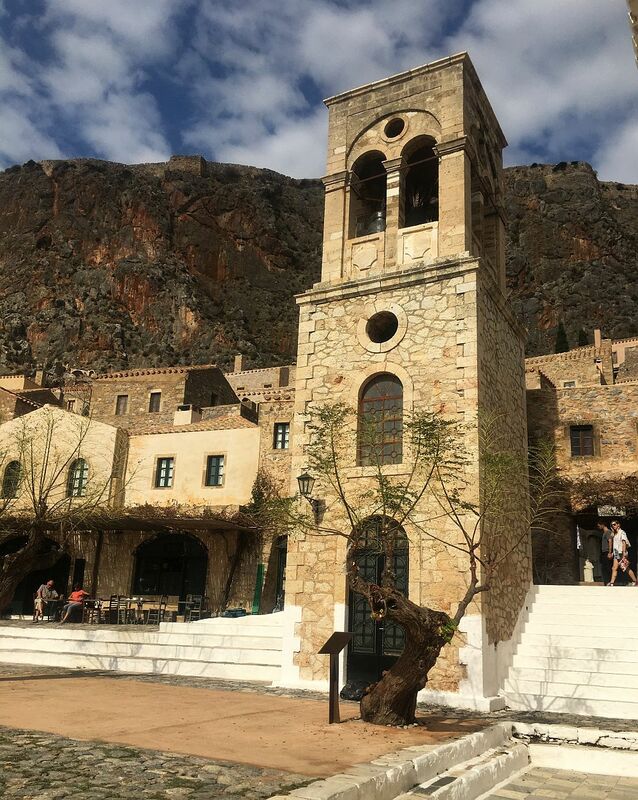 On the other side of the main street there are many boutiques with clothes, cosmetics, olives and olive oil from the area, all with local products, while in the central square there is the Christos Elkomenos church from the 6th century and across the street, a mosque hosting the archaeological collection of Monemvasia. 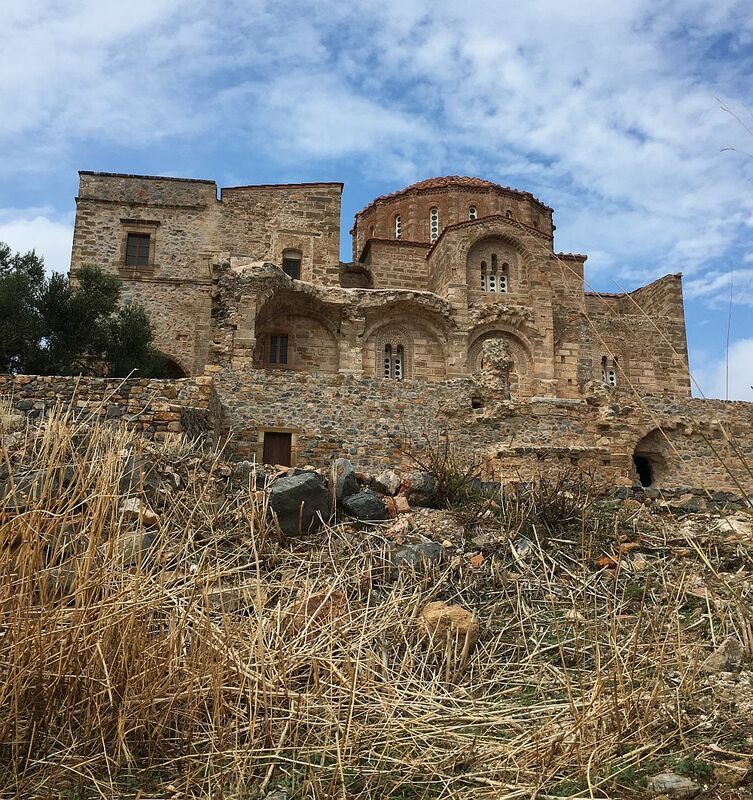 Also up there, 300 meters above sea level, there is a 12th-century church, Aghia Sophia, which dominates the entire fortress. 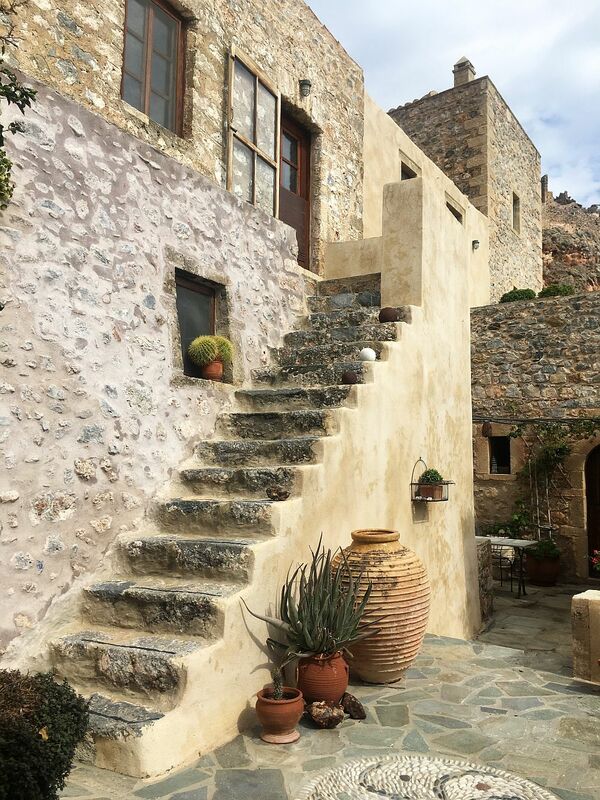 The fortress is full of boutique hotels with modern or eclectic interior decorations that mix traditional architectural and design elements with the current ones. 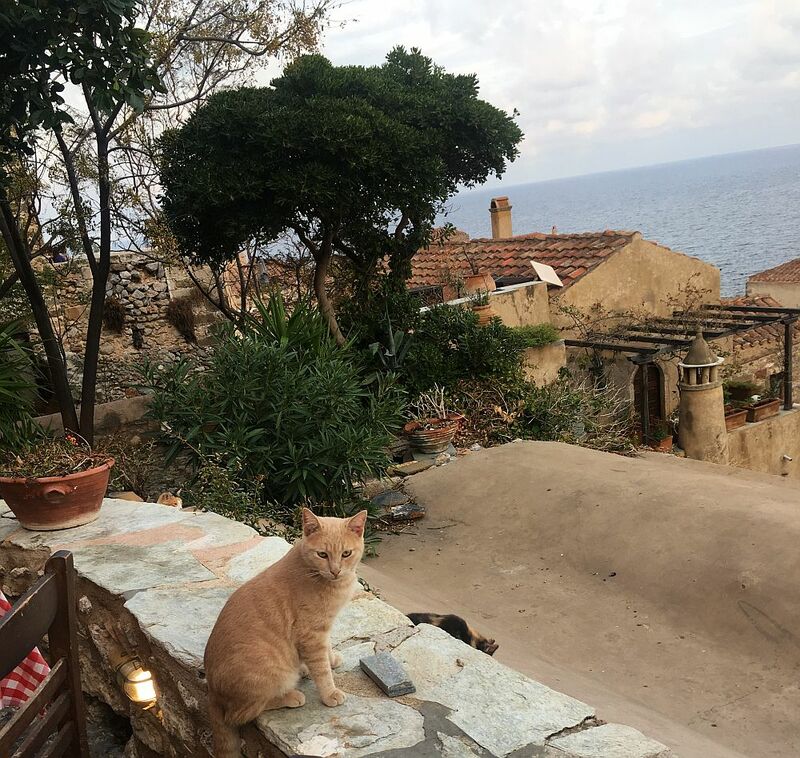 The restaurants, cafes and taverns are very tempting, especially for a dinner in the moonlight, with sound of waves, delicious Greek food and local wine of Malvasia. 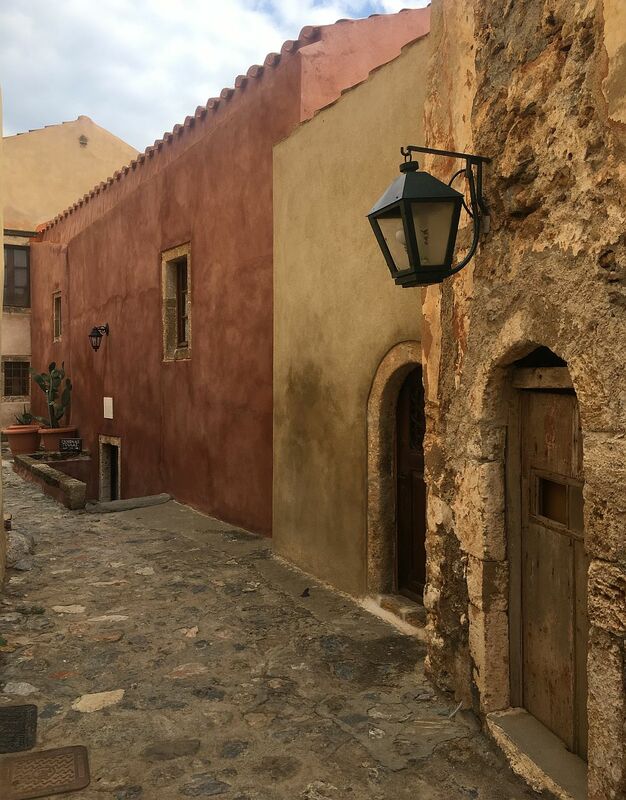 Among the traditional dishes in the fortress would be goges – homemade pasta or saltia – a kind of fried cheese pie with herbs. 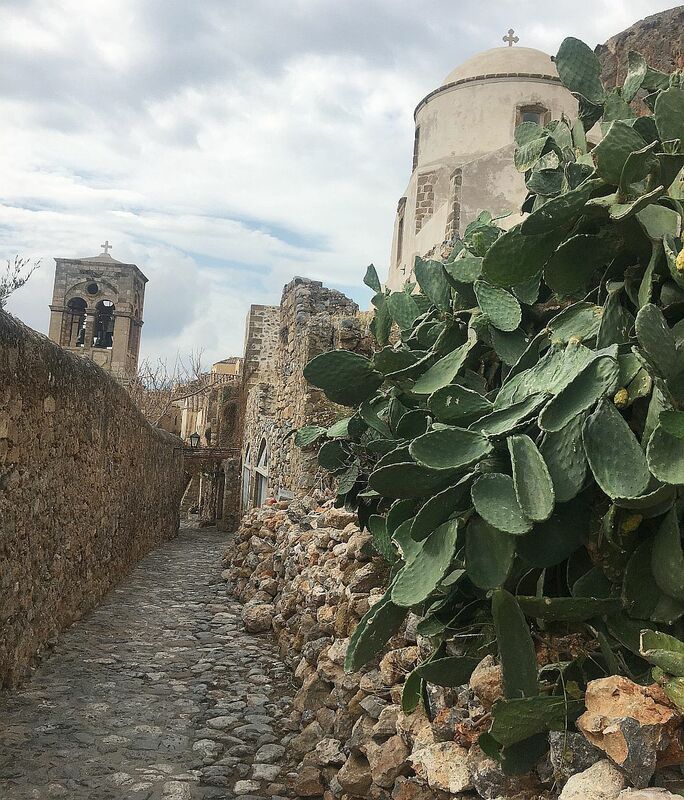 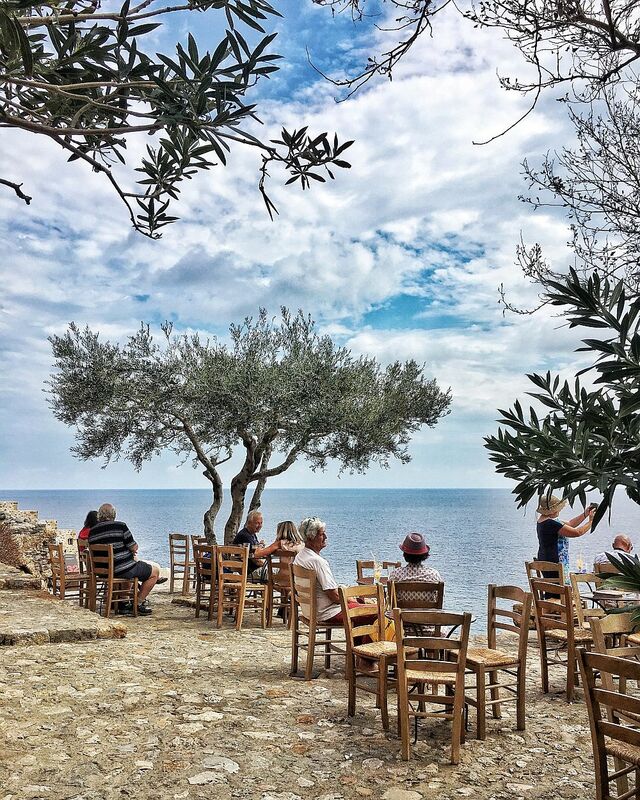 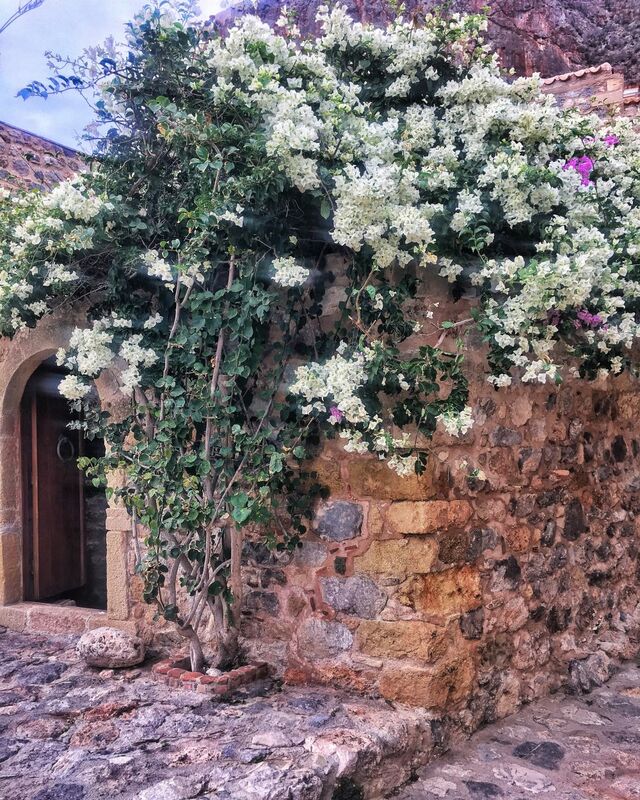 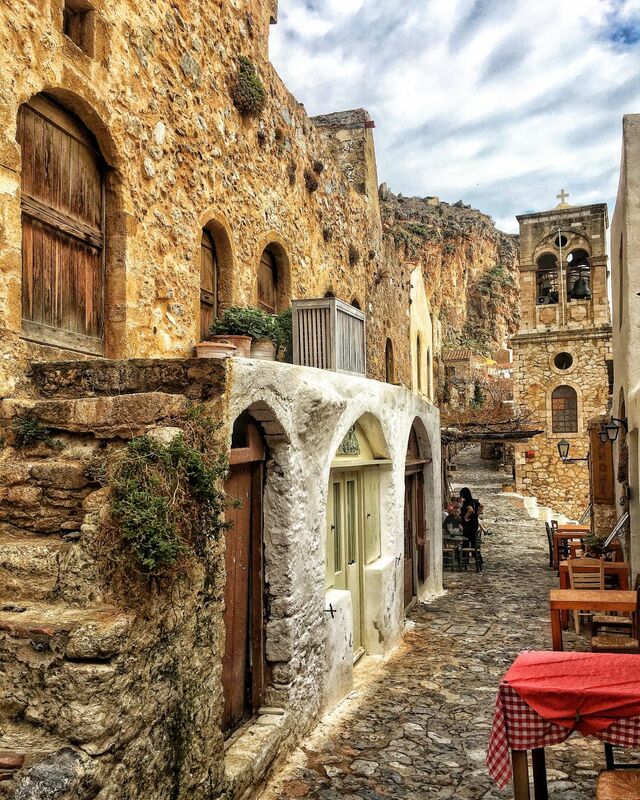 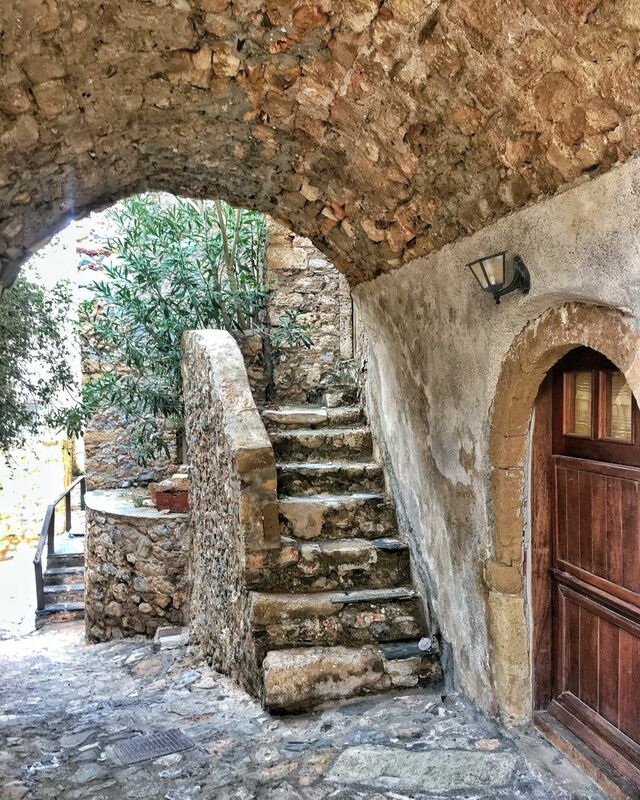 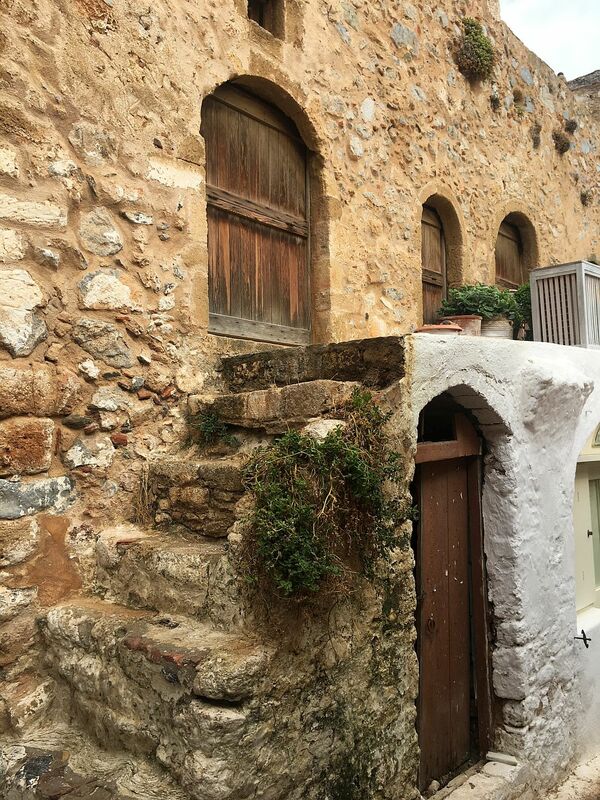 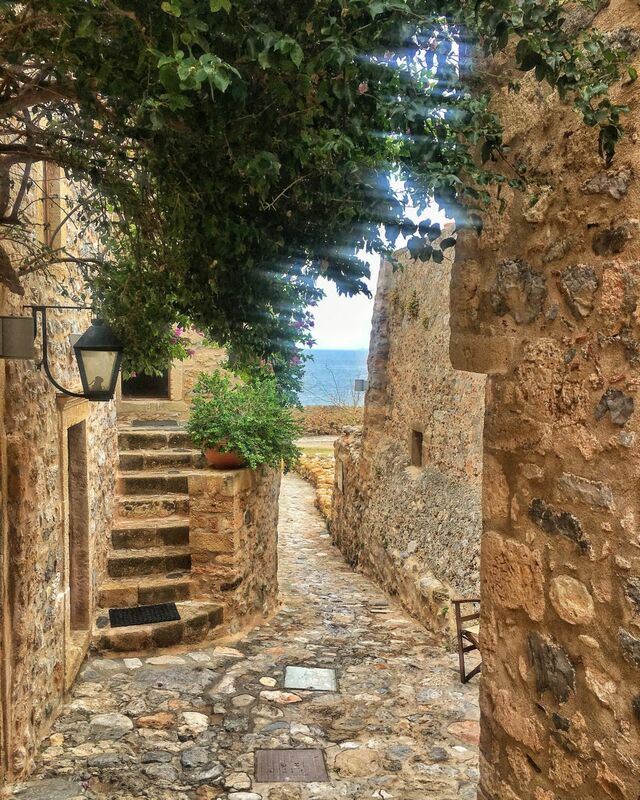 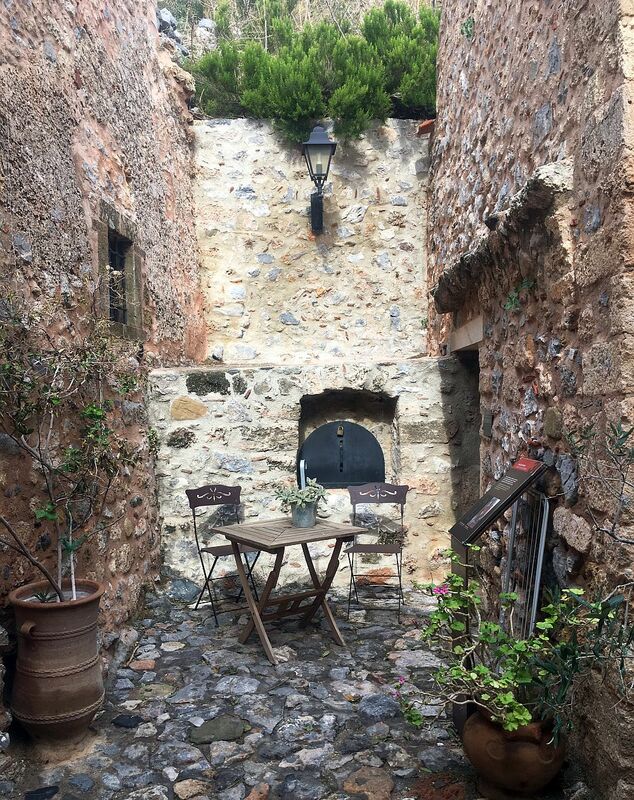 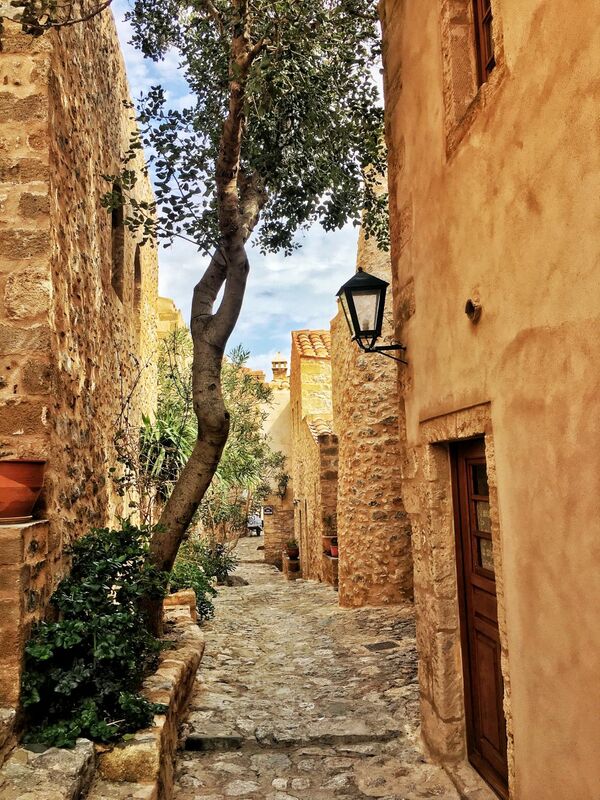 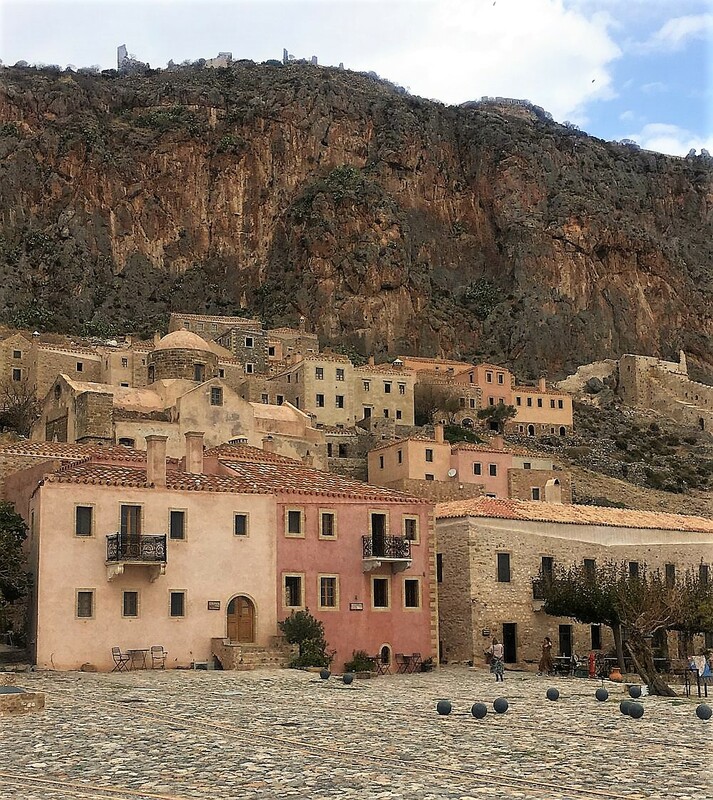 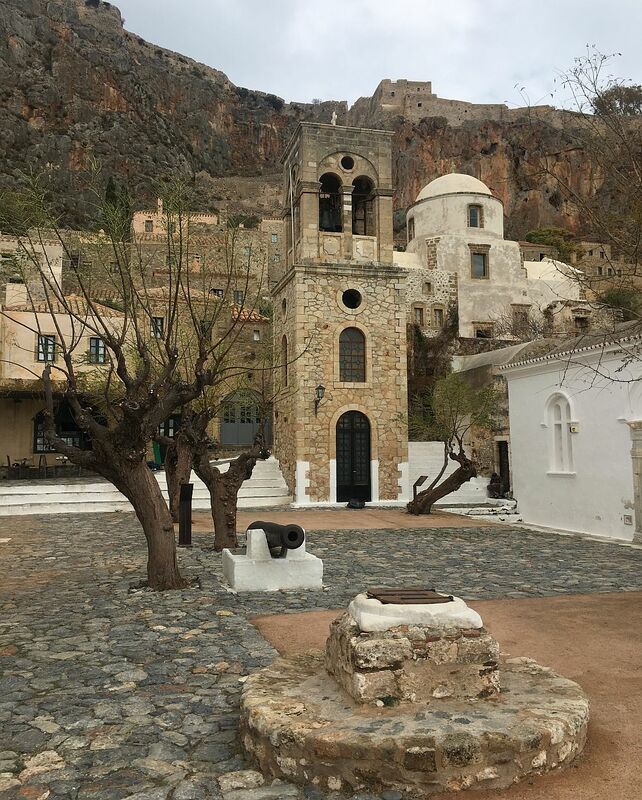 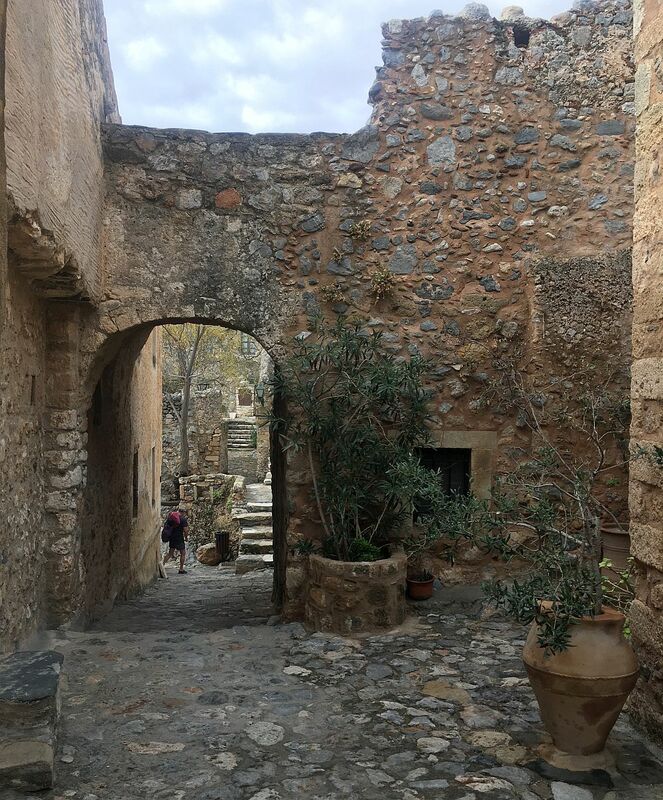 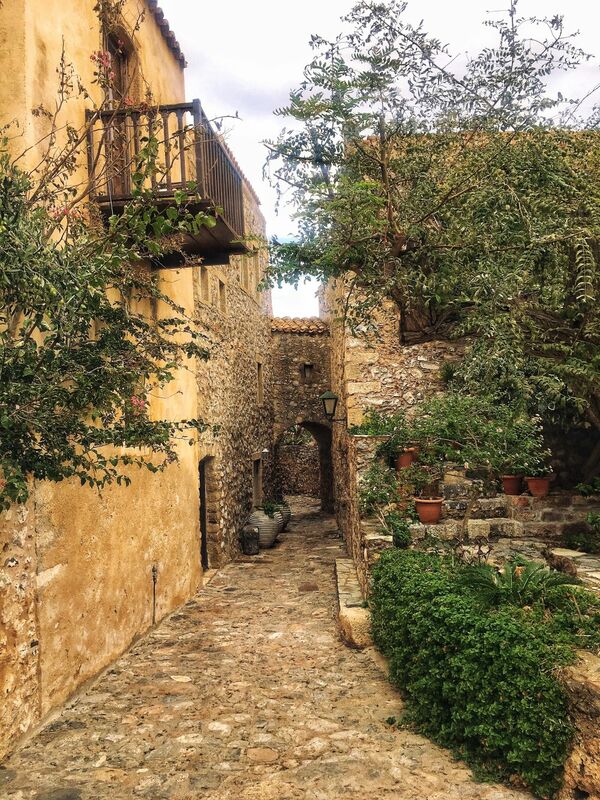 Monemvasia is a place where different epochs coexist simultaneously, like in a fantastic time machine, with narrow cobbled streets and whirling stones that make you walk, discover and feel history in a relaxed, bohemian and mysterious way. 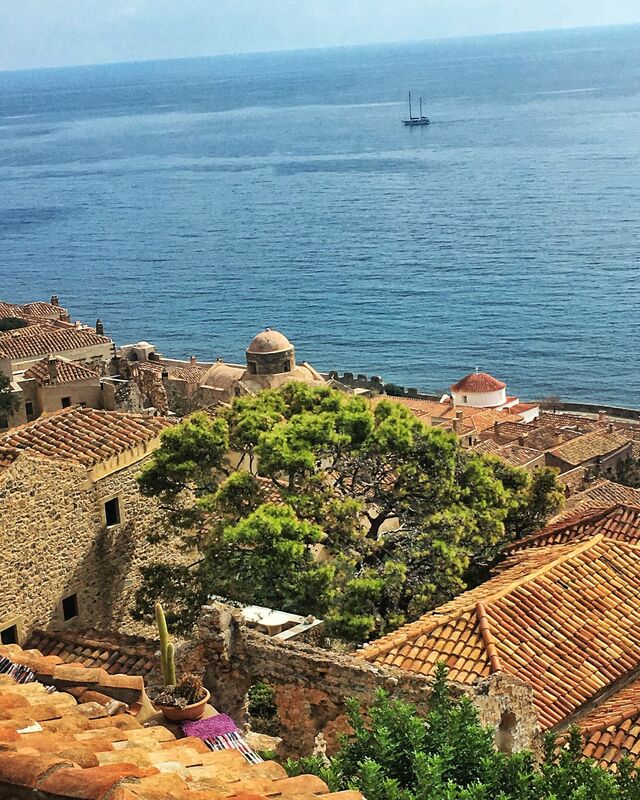 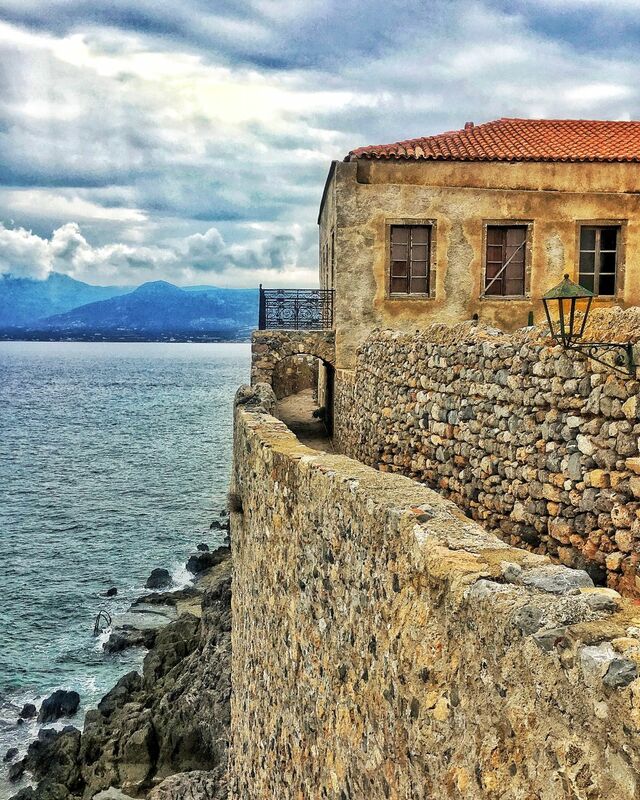 Posted in Travel&DesignTagged Aghia Sophia, ancient castle, ancient city, Ano Poli, cities of Peloponnese, cobbled streets, fortress-city, Malvasia wine, Monemvasia, Monemvasia castle, Monemvasia fortress, orasul castel, traveler in greece, traveler in Monemvasia, traveler in PeloponneseBookmark the permalink. 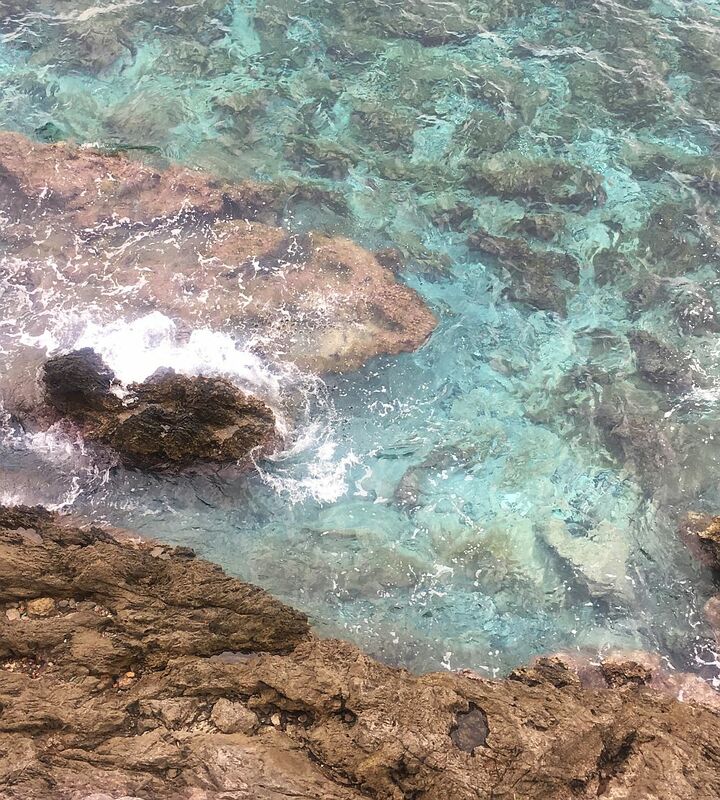 Cele mai frumoase poze ever pe care le-am văzut. 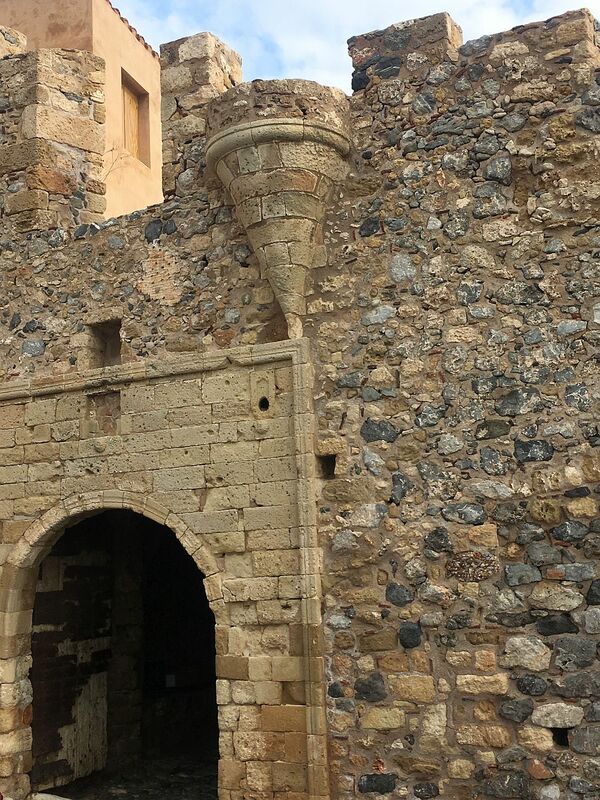 Fascinant!